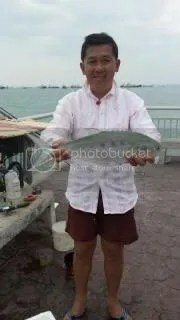 Caught this 900g Wolf Herring last evening. 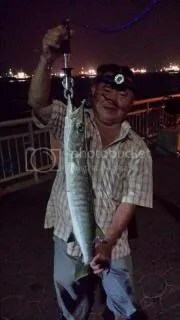 Lai caught this barracuda on the night of 2-3-2014 with a bottom feeder rig. 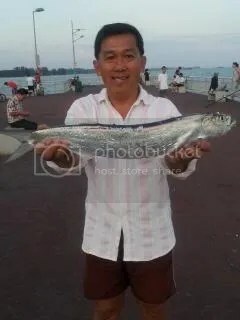 Ah Hong landed his 23th Baramundi on the jetty last nite. The fish took his live prawn on the late evening. Tide was just turning up and current was smooth. It then move away from the jetty and make a round back trying to go under. 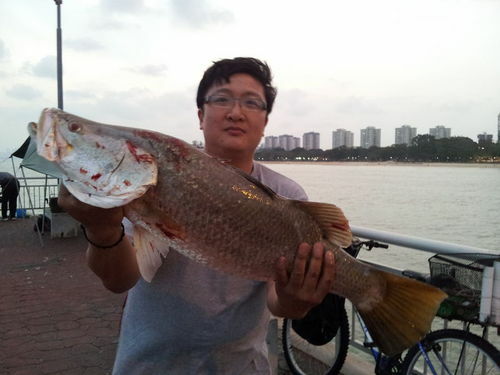 Hong use his rod to steer the fish out…Upon doing that…he broke his 20yrs rod….but eventually he manage to surface the fish with the line intact while I gaff it up. It weigh 5.9kg on the scale.